Rasberry's Pest Professionals has over 38 years experience in pest control in the Pearland, Texas area and can assist you with any pest control problems such as: ants, chinch bugs, rodents, termites, fleas, roaches, spiders, mosquitoes, sod webworms, rats, mice, bees, insects, flies, ticks, and do it yourself pest control supplies and exterminating. Tom Rasberry, is an Associate Certified Entomologist from Pearland, Texas who first identified Rasberry Crazy Ants in 2002. Rasberry has been leading the fight against the Crazy Rasberry Ants, and estimates that he has spent over 2000 hours researching them. 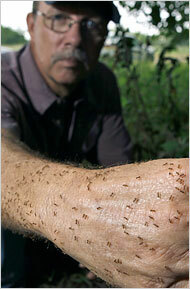 Rasberry was hired by NASA to deal with their Rasberry crazy ant infestation at the Johnson Space Center in March 2008. In my opinion these ants pose a clear and present danger to our way of life, and the time for real action was years ago. If we don't act now the consequences could be irreversible. Do you have lawn damage, seen as yellow to brown patches? Perhaps you have Chinch Bugs.